Thinking about wine travel destinations, then this timely travel article written by guest contributor; Pascale Bernasse, president of French Wine Explorers and, a great source for planning truly authentic wine and culinary experiences in France. You can also connect with them @FrWineExplorers on Twitter. The Bordeaux region is famously well known for its fine wine, it also offers so much more. The summer travel season is nearly upon us, so we'd like to give you our top ten reasons to plan a tour to Bordeaux and find out why this region is so much more than just grapes to glass. 1. Try the wine: Bordeaux produces many types of wine, from dry whites to dessert whites, reds, rosés, and even effervescent wines (crémant). Some of the most prestigious estates of the world are located in Bordeaux. The region does not only produce grand crus or expensive wines; in fact, those wines account for only 2% of the overall production of the region! So there are many opportunities to discover a few new favorites to add to your cellar. 2. Visit the city of Bordeaux: The city of fewer than 300,000 people is easy to navigate and is one of our favorite cities in France. The historic center boasts 18th-century architecture and rivals Paris for the most historical monuments in France. A Unesco World Heritage Site with over 340 historic monuments, a city center that is modern and clean, and plenty of great restaurants and shopping make Bordeaux attractive for all. 3. Visit St. Emilion: The picturesque village of St. Emilion is located on the Right Bank of the Garonne. Merlot is king on the Right Bank with the appellation of Saint Emilion and its satellites, Pomerol and Lalande-de-Pomerol. Saint Emilion has some of Bordeaux’s oldest vineyards, producing well-structured wines with great character from a judicious blending of Cabernet Sauvignon, Cabernet Franc, and Merlot grapes. 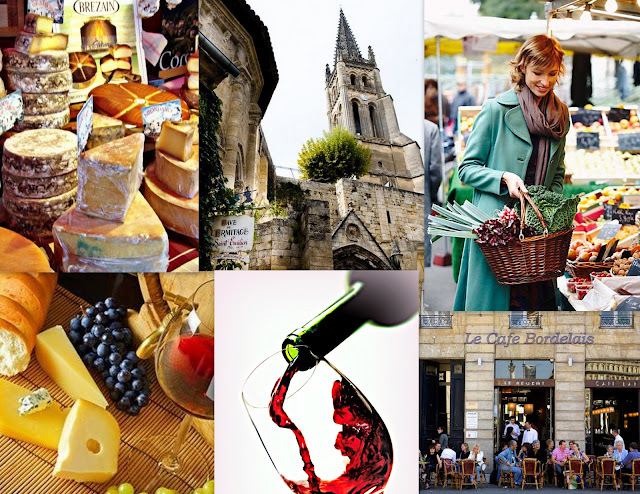 And you can discover the lovely medieval village of Saint Emilion, a UNESCO World Heritage Site, its monuments, many shops and galleries (including some of the region’s best wine shops). 4. Sip and Spa: Indulge in a vino-therapy spa set to renew and relax. Vino-therapy is a beauty therapy process where the residue of winemaking (the pips and pulp) is rubbed into the skin. The pulp is said to have excellent exfoliating qualities and help reduce the problems associated with aging. 5. Try the whites: If you say Bordeaux to most folks right away they think of red wines, aging in barrels sitting in great Chateaus. But don’t forget about Sauvignon Blanc, it is the primary grape variety for the dry white wines of Bordeaux. Sauvignon Blanc is also sensitive to noble rot, so it marries well with Semillon in the great sweet wines of Sauternes. It produces wines which are crisp, clean and medium-bodied. 6. Go to school: There is no better way to discover the culinary delights of Bordeaux than a hands-on cooking class. Different options are available, from a 2 hour class at the Pressoir d'Argent with a Michelin starred chef, to a full week of discovering the markets, vendors and creations that are unique to the area, such as canneles, a sweet brioche style pastry, or the entrecote a la bordelaise, grilled steak topped with a reduction of red wine sauce. 7. A different perspective: Imagine cycling amongst picturesque routes dotted with vines, stopping along the way to take a break from biking and unwind while savoring your new wine discoveries. The area is relatively easy to ride which is practical for the weekend rider and tours lasting 2 hours to a week are available. 8. Go to market: Something for every taste; try the Capucins, where restaurateurs and caterers shop with the locals in the heart of Bordeaux (T-Sun 6a-1p). And in Libourne near St. Emilion; holds a great open-air market of fresh produce on Tuesdays, Fridays, and Sunday. This market (and the indoor market featuring specialty goods) has all the charm of the outdoor farmers' markets found in Provence. 9. Life’s a beach: The Dune of Pyla, the largest sand dune in Europe, is located about 40 miles from Bordeaux, in the Arcachon area. Climb the top of the dune and revel in the amazing views of the area. The Dune of Pyla is also famous for paragliding and the multicolored sails floating in the sky are worth the detour. 10. Eat like the natives: Bordeaux has many wonderful Michelin starred restaurants, such as Cordeillan Bages in Pauillac, Hostellerie de Plaisance in St. Emilion, Le Chapon Fin in Bordeaux, and low country favorites such as La Tupina in Bordeaux and Le St. Julien in St. Julien. Beef, lamb, duck, foie gras and seafood are local specialties and are perfect with the wines of the region. I've heard so much about Bordeaux white wines, generally im more of the red wine person, but with the reviews i've heard and read through friends and other websites im getting more and more curious about this mix, I hope I can finish my school requirements before the term starts so I can tour a bit around Bordeaux, oh by the way I'll be taking a short course in culinary.. im really so excited..